While it is true that cats can adapt exceptionally well to living indoors, they still need to venture outdoors from time to time to express their natural feline behavior where they can scratch and climb on trees and explore the ‘world’ outside their private nooks inside the house. Unfortunately, you cannot open and close the door every time they have this urge to go outside. Thankfully, you don’t have to because they can now do so on their own. But, you’ll have to choose the most appropriate cat door for your kitty. In this article we will look at the 5 best cat doors currently available in the market as well as shed light on a few concerns about the use of pet doors. Before that, however, let’s look at the top 5 cat doors. If you wish to utilize your sliding door as the access way for your feline, then the PetSafe Freedom Aluminum Patio Panel Sliding Glass Pet Door is for you. There are no complicated installations and no drilling and sawing, too. You only need to get the right size of PetSafe Freedom for your sliding door and set in on your existing sliding door track. It doesn’t matter if the size is a bit off since the Freedom comes with a top height adjuster so you can make sure it fits your door. The flexible flap system allows for optimum energy-conservation while giving your pet unrestricted access to your yard and back inside your home. The problem is that, other animals can easily get in, too. At least, you’ll have your pet door in no time. The problem with litter boxes is that they can literally fill your home with a distinct smell that can only be described as unpleasant. And while cat litters today come with odor-absorbing technologies it still isn’t enough to control the odor. With The Kitty Pass Interior Cat Door Hidden Litter Box Pet Door for Cats, you can now utilize a certain room in your house as your pet’s own restroom or toilet. Simply put its litter box inside and install The Kitty Pass on the door and you’ve got a lovely-looking passageway for your kitty. The Kitty Pass is designed more like the silhouette of a cat’s head in front and its bottom and tail at the back of your door. It comes with an easy-to-use template so you can easily make a cutout on your door. It takes some patience to install The Kitty Pass, but once you’re done, you’ll be amazed at its thoughtful design. One of the critically-acclaimed pet doors is the Cat Mate Large Cat Door. It doesn’t look extraordinary. But, if you like the idea of being able to choose how your kitty accesses its door, then this one’s for you. Cat Mate is integrated with 4 locking mechanisms allowing kitties and other pets to go out but not in or go in but not out. Of course, you can also set the Cat Mate for full access privileges, allowing your kitty to go in and out easily. When it’s bedtime and you don’t want your pet to be roaming outside your home, you can set it to Close and keep your kitty inside, safe and sound. The Cat Mate comes with exceptional weather stripping and energy-efficiency. It may require some cutting, drilling, sawing, and bolting through your wall or door, though. 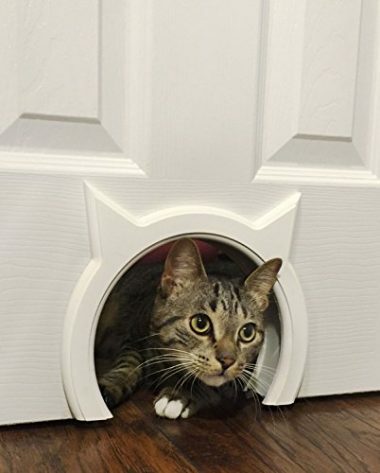 Just like the The Kitty Pass, the CATHOLE Interior Pet Door is primarily designed to separate your pet’s litter box containment area from the rest of your living space. This also helps prevent your kids from ever ‘messing’ around with your cat’s litter box. The main advantage of the CATHOLE is that it comes with a removable brush attachment on the arch of the door. Every time your kitty passes through the CATHOLE the bristles brush against the coat of your cat, removing any debris or particle that may be present on your feline friend’s fur. Most pet parents look at the CATHOLE as an oversized mouse hole, although you do have the option to customize the Baltic Birch wood-constructed doorway. Since it comes in white, you can easily paint it to match the color of your door. 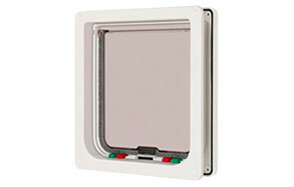 The Perfect Pet Soft Flap Cat Door with Telescoping Frame is preferred by a great number of kitty-lovers because of its tamper-proof mounting technology. Other cat doors are easily damaged and removed from the outside, providing access to certain individuals who are out to do no good. The door flap is made of thermoplastic material, giving it exceptional strength and superior impact resistance. Most cat doors have a maximum door thickness requirement of only 1.75 inches. The Perfect Pet can be installed on doors that are 2-inch thick. 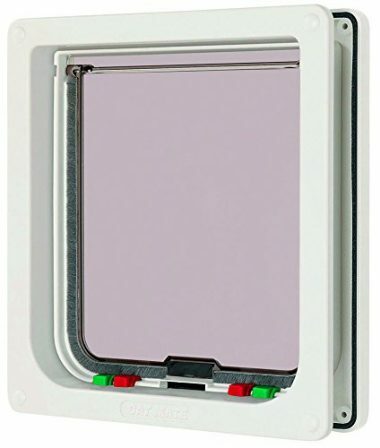 Our only concern is that it doesn’t come with 4-way locking mechanism to help pet parents decide on how their respective pets access the Perfect Pet Soft Flap Cat Door. Nevertheless, it should still be a worthy investment to keep your kitty happy. Are you looking for the right pet door for your kitty? If our list of the 5 best cat doors didn’t appeal to you, then perhaps we can help you find what you’re looking for with our best cat doors buying guide. This type of cat doors is installed directly on doors. 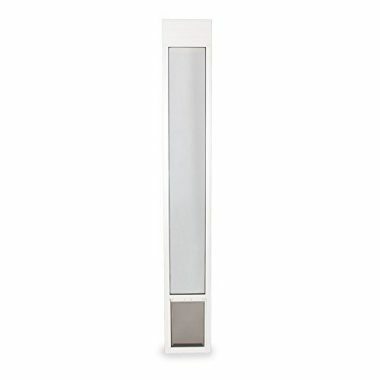 One of the principal considerations to using this type of cat door is the thickness of your door. Manufacturers have their own recommendations on the door thickness that their products can easily fit in. These cat doors are installed, as the name implies, through the wall. In many ways, these are a lot similar to cat doors for doors except that they often have tunnels that connect opposing ends of the cat door. This is because of the relatively thicker or wider distance between the interior and exterior outside surfaces of the wall. There are also cat doors that are specifically designed for windows. These typically come in either a side-sliding model or a sash-style type. 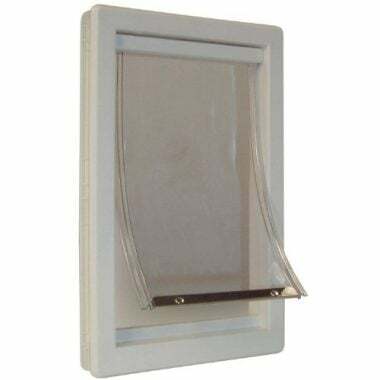 The installation of this type of cat door can be quite tricky although more modern styles now use a combination of tempered safety glass and heavy-duty aluminum. These are also called as patio pet doors and are a lot similar to cat doors for the side-sliding window type; although this one is built especially for sliding doors. There are actually no complicated installations as you can always use the existing track on your sliding door. Most pet parents are concerned about installing pet doors in their home since this will also invite other animals to go inside the house. Electronic cat doors can help prevent this from happening. The idea is that of a lock-and-key mechanism. Only the cat that has the ‘key’ can open the ‘lock’ on the cat door. The ‘key’ is typically a sensor tag that your cat wears while the ‘lock’ is a sensor and trigger mechanism on the door. When the ‘key’ is nearby, the ‘lock’ senses it and opens the door, allowing your cat to effortlessly pass through. Other animals can also pass provided they have the same ‘key’; if not, then they don’t get access. Now that you have an idea of the different types of cat doors, the next order of business is gain an understanding of the different things that you have to look for in a cat door. Here are some of the more important ones. As much as possible you should get a cat door with a flap size that is appropriate for your cat’s size. Ideally, you’d measure the width of your cat and add an inch to the measurement to get the minimum width of the door. Next is to measure your cat’s chest or torso height taken from its shoulder all the way to the lowest level of its chest or tummy, whichever is lower. Add an inch to the measurement to give you the height of the cat door. Cats have wider bodies so you may want to stick with cat doors that have a more squarish design than it is tall. 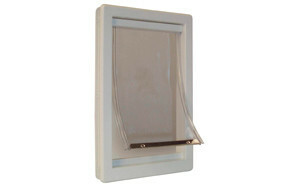 Additionally, you will want a cat door with flaps that are nearly transparent. Cats would want to see where they are headed. Call it a predator’s instinct, so it is natural that they prefer going through a door panel that gives them a glimpse of the outside. There are different types of secure access in cat doors. There are those that are freely open so cats (and other animals) can freely come and go. There are also those that come with a 2-way lock. This system has both lock and unlock functionalities. There are also those that come with 4-way locking systems. In addition to the 2-way, these systems also allow an in-only access or an out-only access. Deciding on what system to get actually depends on what you want for your pet as well as the presence of other animals in your area. Whatever you do it is critical to look for a product that is quite easy to install. It makes no sense to purchase a high-quality cat door if you still have to hire a professional to install it. Try reading consumer reviews to have an idea of the relative ease or difficulty of setting up the cat door. Like all products not all cat doors are created equal. Although products may look the same, there are those that are simply of mediocre quality to begin with. Unfortunately, there really is no definitive way to ensure durable construction for a product that is yet to become yours. So you’ll have to rely on the experiences of your fellow pet parents and make your decisions based from your research. Installing a pet door is a very pretty straightforward process. Each pet door manufacturer will provide users with clear directions on how to install their products on the wall, door, or even window. The most important thing to remember is to read the directions carefully. If you’re installing a pet door on your door for your pet, you will have to remove your door from the frame that it is mounted to. This allows for more efficient work. Once the door has been taken down, you can use the cutout template that usually comes with pet door products. Usually, the template is lined up at the center bottom of your door. The template is then outlined and sawed to create the hole for the pet door. You can then install the pet door through the hole following the precise instructions of the manufacturer. You can then re-mount the door into its frame. For those who are installing a pet door on their wall, the procedure is almost similar with that of in-door installation, except that there is no door to remove from the frame. Instead you will have to cut a hole directly through the wall following the template provided by the manufacturer. Depending on the thickness of your wall, you may have to insert a tunnel lining that will bridge the opposite sides of the pet door. Should I Allow My Cat in the Yard? Cats really don’t mind staying inside the home for countless hours at a time. Many have learned to adapt to indoor living quite well that bringing them outdoors can be especially stressful for them. However, feline experts strongly advise encouraging cats to go outdoors primarily to express their natural feline and predatory instincts, except when there is a medical need for them to stay indoors. Perhaps the most important reason why you should allow your cat to go outside is for it to play out, nurture, and fine-tune its natural feline behavior. Being on the hunt in an environment that is largely different from the one they are accustomed to can help sharpen your cat’s predatory senses. Cats are natural hunters. Scientists say that hunters don’t actually go on such activities because they need food. Instead, hunters hunt because of the thrill, the excitement, and the sense of fulfillment that the endeavor brings to them. The same is true with cats. When they are able to hunt in a natural environment, they feel happier and more content. Indoor cats may be given interactive cat toys. The main issue with such items is that they tend to be repetitive or may follow a very predictable pattern. Cats are hunters and the hunted never go in very predictable patterns. That is where the joy of the hunt lies. When you give an interactive toy to your cat, if you don’t know how to use it properly, you risk your cat getting bored. Boredom leads to mental stagnation and can be linked to a host of behavioral issues. Sending your cats out can help improve their mental state because of the simple fact that all of their senses will be at work processing a multitude of stimuli coming from a bevy of sources. Of course, there are also valid reasons why you shouldn’t allow your cats in your yard. Chief among these is injuries. Sometimes, they can get into a fight with other cats or even dogs and people. Contact with other cats can also bring about another type of harm – disease. There are a number of feline diseases that are easily transmitted by infected cats and other animals. 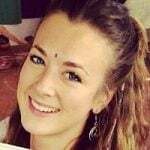 There are parasites, too, that you have to worry about. Fleas and ticks as well as other ectoparasites can wreak havoc on any cat. There may be poisonous substances outdoors, too. For instance, antifreeze has been known to kill cats because it is particularly toxic to them. One of the worst nightmares of pet parents is when their beloved pets get lost or go missing. There’s nothing more frustrating than not knowing what happened to your pet. The decision to allow your cat in your yard is yours to make. The safety risks associated with letting cats outdoors should always be considered in the light of the benefits the outdoors can provide to your pet. What’s the Difference Between a Cat Door and a Dog Door? 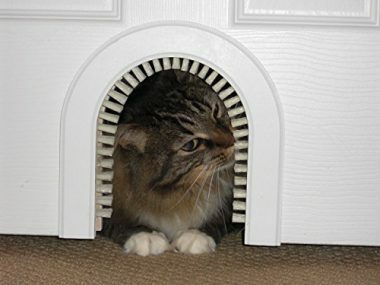 While it is easy to say that there’s really no difference between a cat door and a dog door, both being pet doors, there are actually a few very subtle differences that are grounded in the unique anatomical differences between cats and dogs. For instance, cats have wider bodies relative to their height. As such a cat door is usually wider and shorter or squarish while a dog door is typically narrower and taller. Being predators, cats need to see the other side of the flap. The flap design should, thus be translucent if not transparent. Dog doors, on the other hand, are usually made of solid or opaque opening panels. Lastly, cats don’t like anything touching their backs. Soft flaps typically drag along the kitty’s back while hard flaps don’t really touch the cat’s back that much. It is for this reason that cat doors are almost always designed to have a soft door flap. How Will the Cat Door Prevent Other Animals from Entering My Home? Using a cat door to prevent other animals from entering your home can be quite tricky. The point here is that if your pet can easily get in and out of your home, then other animals will have the same ease of access, too; unless, you have a device that allows the cat door to open only when the appropriate trigger is registered. This is where electronic pet doors can be very useful. Typically, a device is attached to your cat’s collar. This continuously emits radio signals to a transceiver and sensor on the cat door. When your cat approaches the door, given a preset distance, the device on the collar communicates with the sensor on the door which, in turn, ‘unlocks’ the door to grant access for your cat. This can also occur when your cat is going inside your house, usually depending on the model and type of cat door that you use. Since only your cat has the ‘key’ to the door, then other animals that don’t have this ‘key’ will not be able to enter your home. Different products use different systems of creating a ‘lock-and-key’ mechanism that only your cat has the privilege of wearing. This is the only way you can have your cat door prevent other animals from gaining access into your abode. Cats need to go outside so they can fulfill their natural instincts. Cat doors exist because of this inherent need of cats to explore and enjoy the world outside their homes while still giving them the ability to go home anytime and without bothering the activities of their human masters.